This is a very hands on intense course. Learn all the hints, tips and skills of butchery that will enable you to negotiate a carcass with confidence. and roll and tunnel bone. After a brief stop for delicious home made lunch, in the afternoon together we will dry cure some of your wonderful pork into additive free bacon and make sausages. 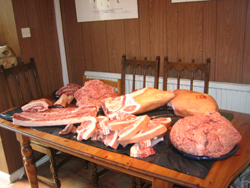 We will provide everything you need to pack and label your pig for your freezer, all equipment and protective clothing as well as as much tea and coffee as you can drink whilst you are with us. ADDITIONAL PEOPLE CAN BE ADDED TO YOUR DAY AT THE COST OF £75 PER PERSON. Butcher a pig on day one and process the complete pig, nose to tail on day two. Exact content can be tailored to your interests and requirements. You will learn where the different cuts come from and what can be done with each cut. From this information between us we can create a cutting plan which will shape the content of day two. Our aim is to show you how to use the whole pig and what can be achieved in a normal home kitchen using everyday equipment. For the first half pig you watch us as we cut and talk our way through the butchery process. Then the second half is when you take over and under our friendly guidance you butcher the whole half pig yourself. Day two will be the processing of the half pig you have already butchered. See the processing course below for possible content. £110.00 per person per day (based on two people booking). Process a pig, nose to tail on this course and turn every scrap into scrummy, tasty treats. As our courses are bespoke you can select which items you would like to make from the list below or we can select for you. 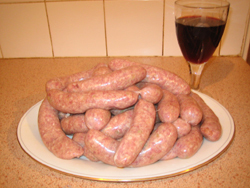 Sausages; Make sausages and learn how to devise your own sausage recipes (including fresh and dried chorizo) and how to link them. Bacon; Learn the difference between wet and dry curing and how to do both. Hams and Gammon; Make your own brine cures and set gammon to soak. Brawn/pork terrine; Make this retro classic from scratch. Faggots; Forget Brains Faggots (yuck!) these offaly meatballs are winter warmers to die for. Hand raised pork pie; Have you seen it on the Great British Bake Off? Come and make your own stunning homemade pork pie! Black pudding; Find out how to make your own homemade black pudding. Lard; Render down lard and learn the principles of making your own hand soap. Including samples of your endeavours to take home is £120.00 per person (based on two people booking).